RNI is a powerful cloud application that comes with an easy to use admin interface. 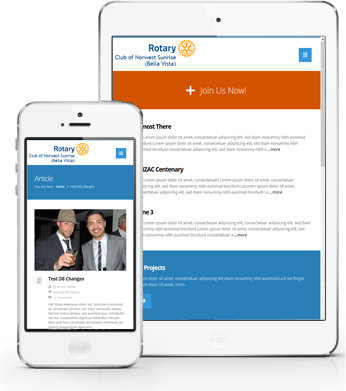 Set up your new Rotary club website in no time! Over 100 clubs and districts can't be wrong. We offer a free basic site template and the option of using your own! RotaryNews.Info (RNI) enables non-technical users to easily publish content, this frees up members to focus on content. Any approved user can quickly and easily publish online without complicated software or programming. Design templates provide a consistent brand and standard navigation. Manipulate content without fear of accidentally changing the design. Website managers have access to shared resources, such as documents, images, audio and video files, etc. Give different levels of access to different users. It automatically scales your site to fit tablets, mobile devices and smaller browser windows. Access and update your site from anywhere with an Internet connection. Started in early 2007 by 2 rotarians, Robert Keast and Bruce Walker to service Rotary District 9680 websites and administration needs. The project scope was expanded to Australia wide before it was launched, with clubs and districts in other areas of Australia expressing a wish use the RotaryNews.Info web application. Launched at the 2007 District 9680 conference it was an immediate success and in the following years the district provided training in its use to any Rotarian from within and surrounding districts. The original site page design was provided by a student from Hornby TAFE. Application programming and design integration has been provided by Bruce Walker. Robert Keast provided the concept and initial support, he withdrew from the project in 2010 to focus on his successful business. Built by Rotarian's for Rotarian's using Rotary organisational structures. Easy to understand user experience providing all the tools required, without having to know complex programming. Optimised code on powerful servers ensuring a rich user experience. Scales to any device screen, access and update your site from anywhere with an Internet connection. Mobile-savvy internet users now accounts for more than 40% of all traffic on the web and are increasingly less-forgiving of a poor mobile experience. Through recognising the device, the RNI application uses a combination of liquid layout and scaling images to re-flow content, presenting it at the correct size and format for the device. Our aim is to help you present your Rotary to the widest possible audience, where ever they are, and on what ever device they are using. Use RNI to power your web site. Manage all users and content in one place, saving you administration time and money. If you don't find answers online our support team can help with your specific question by phone, or email. Common questions are answered in our FAQ's and this is the first place to look for a solution to your problem.